Say what you will about the Pinterestification of the Internet, one thing these virtual pinboard platforms offer is an engaged, interactive community. There have been dozens of Pinterest clones that have popped up, targeting niche demographics like men or fashionitsas. But Favery’s founder and CEO Anne Nichols believes she’s taking sharing a step further. With Favery, which officially launches out of beta today, users can receive feedback from the community as well as friends to help with making decisions for “life’s important events.” If you’re shopping for a new baby, trying to decide what wedding dress to get, or need some input on Christmas presents, Favery might be able to help. Of course it can’t be ignored that Favery’s design mimics the virtual pinboard style that Pinterest made so popular. If you’ve been a long-time Pinterest user, navigating Favery should be a breeze. Creating new pinboards, browsing the news feed of content, and checking your friend’s boards are all features that function like you’d imagine they would. Favery even offers a bookmark button that you can add to your browser. But Nichols explains there are unique features that differentiate the site from other pinboard clones — the most distinctive of them being Favery’s voting mechanism. For example, if you’re wondering what type of gift you’d like to purchase for your friend’s baby shower, you can choose to compare up to nine relevant pinned images from your pinboard that your friends can vote on. 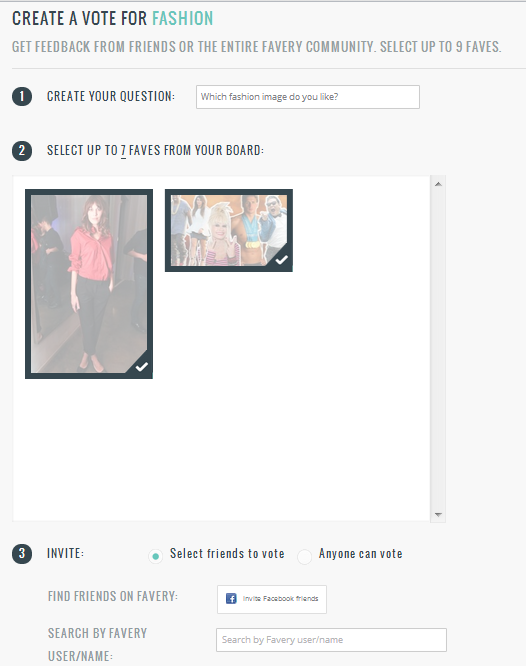 The process is simple: You type in a question you’d like to ask your friends, select the nine images, and invite your connections via email or Facebook, or ask other Favery users to weigh in on on your decision. 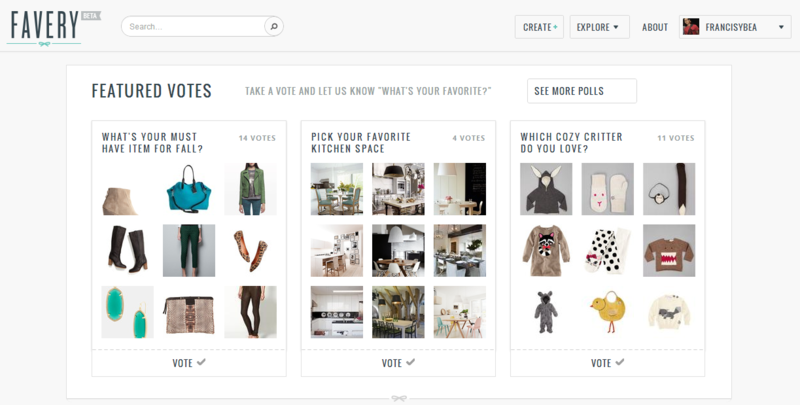 Nichols says that in its early beta stages, design professionals and small businesses like fashion startups have taken advantage of the voting feature. It has been a beneficial tool for interior and fashion designers, as well as other vendors to share ideas with their clients or fans to get some direct feedback — after all, consumer opinions are incredibly valuable. An additional feature to Favery is that it enables users to select the privacy settings for each pinboard. So for users who intend to use Favery with clients, they can restrict the visibility of the boards to specific individuals. Given the fact that Pinterest had some problems with copyright issues, we had to ask Nichols how Favery would avoid being trapped by the legal gray surrounding the hosting of third-party user uploaded content. If you’re publishing images taken from the Web, legally you do not have the right to republish someone else’s content without consent. And today it’s a “publish first and ask questions later” approach that most sites are following. But Nichols explained to us that their terms are explicitly outlined for laymen and easy to understand: If a company or user would like their content taken down, they “can send an email or contact Favery by phone,” Nichols says. As with the rest of the Internet, Favery knows it’s easier to ask for forgiveness than permission, and this means the team will have to be proactive about respecting artists’ request to pull content.